You don't have to have an opinion either way on the Tory government positions on Brexit and Venezuela in order to recognise what an outrageous pack of hypocrites they're being. The mainstay of the Tory government argument against another EU referendum once the terms of Brexit have become clear is that people can't just vote again and again until they get the result that they want. Even though proponents of another EU referendum can point to the compelling evidence that Leave campaigners lied, cheated, and violated the referendum spending laws, the Tory government remains steadfastly opposed to another referendum. 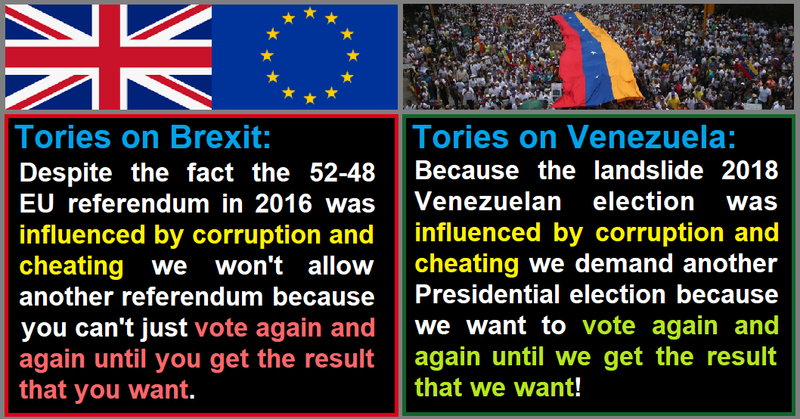 However when it comes to Venezuela and the right-wing coup plotter Juan Guaidó simply appointing himself as President (despite not even having contested the 2018 Presidential election that delivered a landslide victory for the elected President Nicolás Maduro) the Tories have adopted the exact opposite position. This time they point to accusations that the vote was manipulated by corruption and cheating in order to demand a redo of the election. They're demanding that the vote be held again and again until they get the result that they want! When it comes to their own favoured policy of creating a Brexit economic meltdown they argue that redoing ballots simply because people don't like the result is absolutely unthinkable, but when it comes to elections in foreign states that they shouldn't even be interfering in, they suddenly come out arguing strongly in favour of redoing the ballot until they get the result that they want. The remarkable thing here is that you don't have to be in favour of a second referendum, or any kind of Maduro supporter to spot this glaring hypocrisy. All you have to be capable of is spotting that the Tories use one argument to support their own position when it suits them, but then use precisely the opposite argument to support their policies in different circumstances. The use of mutually contradictory arguments to support their policies is indicative of the fact that both of the policies were actually decided by other factors, and that the arguments they're utilising to defend their policies have simply been added as post hoc justifications. When it comes to Tory government strategy their policies are decided first and then the arguments they plan to deply in defence of the policies are added in later regardless of whether they're consistent with the arguments they've used to defend their other policies. Any rational government would consider the arguments first using a logically consistent assessment framework, and then decide their policies accordingly. But this is clearly not what the Tories are doing. The fact that the Tories decide their policies first before cobbling their arguments together later tells us two things very clearly. The first is that their real reasons for pursuing the policies remain hidden (we can hazard guesses that disaster capitalist motivations lie behind their strategy of deliberately triggering a Brexit economic meltdown, and that corporate seizure of the vast Venezuelan oil fields lies behind their Venezuela policy). The second is that the Tories are treating the British public like a pack of absolute idiots who can't even spot how weak and illogical Tory party arguments are even when they're mutually contradictory. 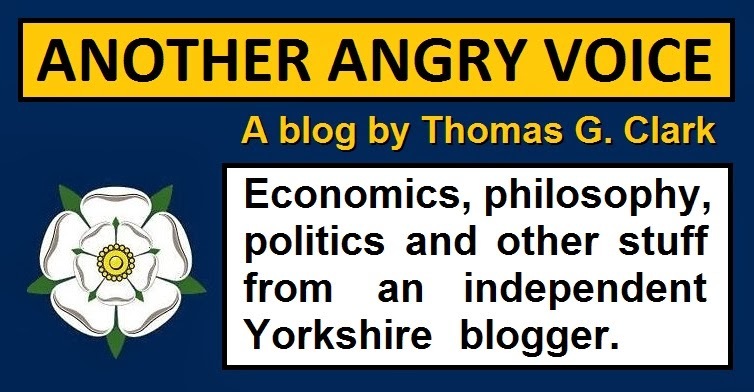 So even if you somehow agree with the Tory strategies on Brexit and Venezuela, it's difficult to deny that they're hiding their real motivations for these policies, and impossible to deny their absolute contempt towards the general public when they expect us not to even notice that their arguments are mutually contradictory.